A circus is rolling up with high flying acrobats, tumblers and clowns promising thrills and spills for all the family. 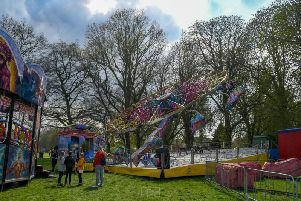 Circus Wonderland initially comes to Northampton Recreation Ground in Kettering from Wednesday May 17 to Saturday May 21 and then it will be followed by a trip to Spencer Park in Rushden from Wednesday May 24 to Monday May 29. Appearing in the UK for the first time from Morocco, the Casablanca Troupe will be fearlessly flipping and flying across the arena, whilst Marton Perna will be freewheeling into the spotlight to perform spectacular stunts on his breath taking BMX. Daring Moldovan trapeze star Nadia defies gravity high in the roof of the Big Top, and Ruslan Arlanov stylishly spins around the circus ring in his revolving Wonder Wheel. Amidst the action and excitement, award winning clowns Kakehole and Mr Popol are returning to scale new summits of silliness with their crazy comic capers. For further details or to book tickets call 07531 612240 or visit www.circuswonderland.co.uk.